Strange, ritualistic and stuck in a time warp—it’s easy to discount the annual People’s Congress. And a mistake, says Minxin Pei. 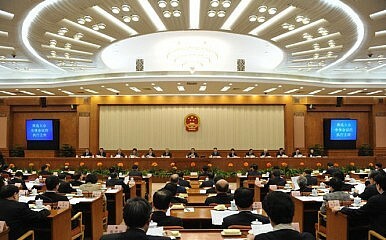 There’s something peculiar about the annual sessions of China’s National People’s Congress (NPC). Nominally the supreme decision-making body under the Constitution, the NPC actually exercises little real power, other than endorsing the policies already approved by the top leadership of the Chinese Communist Party (CCP). Yet it would be a mistake to believe that the convening of the NPC each March should not be taken seriously. After all, the Chinese government expends enormous manpower and resources to ensure that the NPC’s annual sessions are flawlessly staged. The capital gets a scrubbing, the censors work overtime to ensure that no bad news or controversy spoils the occasion and the secret police haul in dissidents to prevent them from disrupting the congress. Meanwhile, the venue of the congress, the Great Hall of the People, is a replica of Stalinist architecture that stands out as one of the most glaring incongruities between an increasingly diverse and fast-changing society and a post-totalitarian state frozen in political time. If one compares Chinese society today with three decades ago, it would be hard to find many similarities. But if you dig up an old photo of the NPC annual session from 1980, you’ll be struck by the remarkable similarities. Of course, Chinese leaders today are much younger and better dressed. But the setting of the congress, with the top leaders seated on the stage and the smiling delegates holding up their hands to rubber stamp legislation proposed by the Communist Party, is essentially the same. And, in a fundamental sense, the NPC has little connection with real Chinese society. The delegates—2,908 in all—are picked by the Chinese Communist Party. In terms of background, the NPC delegates reflect the Chinese party-state rather than society as a whole, because a majority of them—more than 70 percent—are government officials, CCP functionaries and military officers. Things would have been quite different had the post-Mao leadership followed through on their pledge to reform China’s political system. Under Deng Xiaoping, the revival of the NPC was accorded top priority. During the 1980s, a decade now considered by Chinese liberals as the golden age of reform, the NPC made real progress in turning itself into a policymaking body with its own institutional identity and interests. However, after the Tiananmen crackdown in June 1989, the liberalizing trends were reversed and the role of the NPC in China’s policymaking process declined. Today’s meets are a far cry from the 1980s, when the debates during the annual NPC sessions were far more lively, even raucous. Some observers might remember, for example, the highly-publicized debate in the 1988 NPC session over the proposed construction of the Three Gorges Dam, or the heated (but open) discussion on China’s Bankruptcy Law the same year. Donald Trump Won. Prepare For Uncharted Geopolitical Waters in AsiaWhat Is China’s Way?The Implications of China’s Anti-Corruption DriveIn a Sensitive Month, China Touts Progress in Tibet Is Xi Jinping a Reformer?